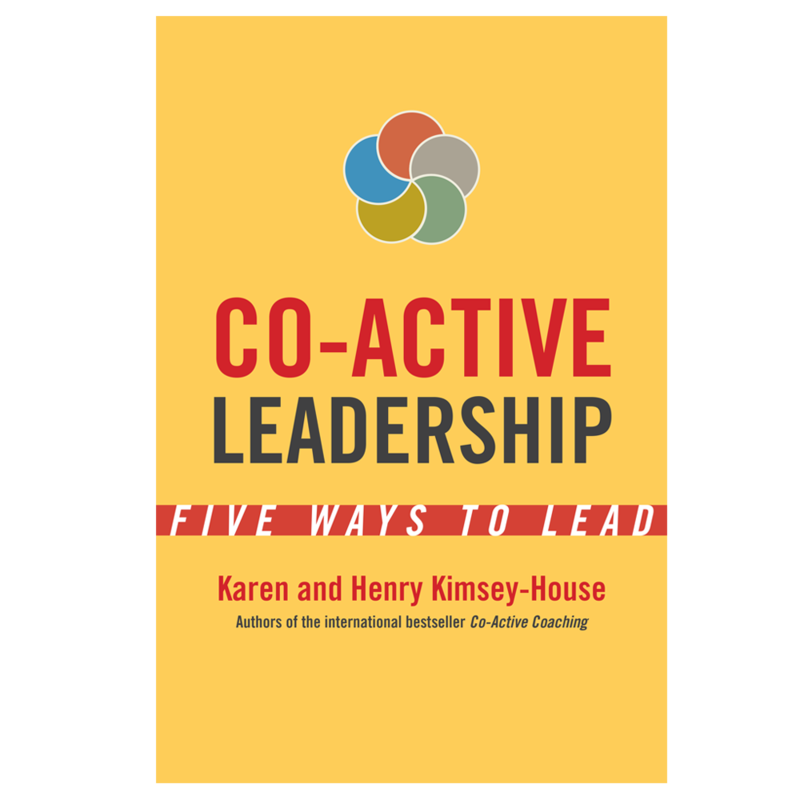 This week I am excited to be participating in the launch of Co-Active Leadership by Karen and Henry Kimsey-House. The authors begin with a new definition of leadership itself: “Leaders are those who are responsible for their world.” Which of course we all are – or should be – so that everyone is a leader. 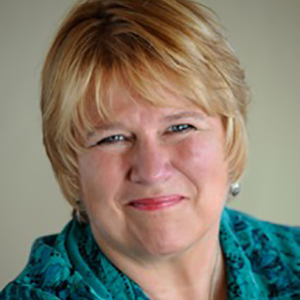 The following is a guest post from Karen Kimsey-House. 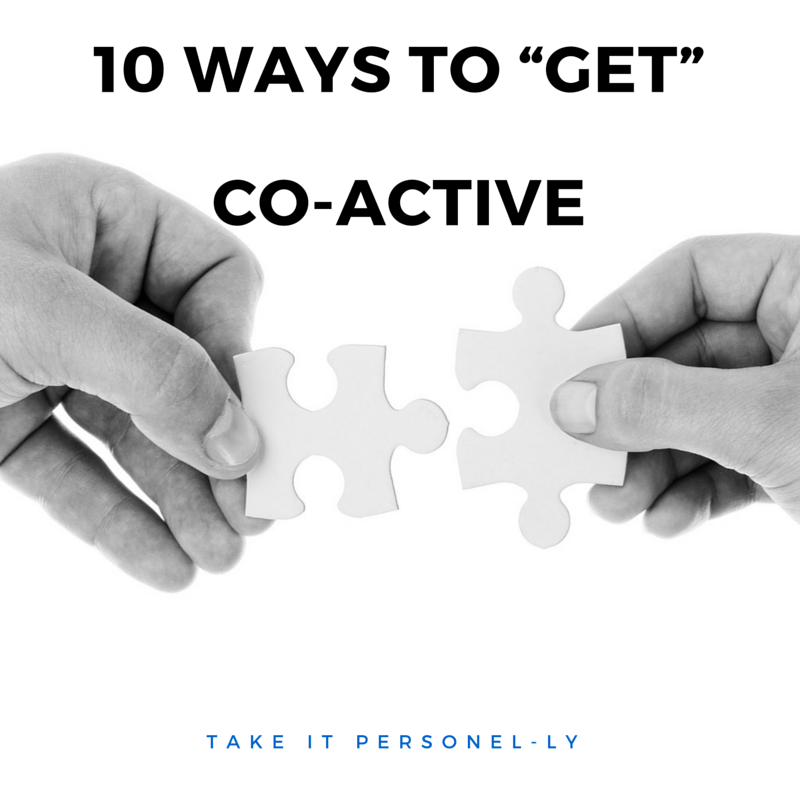 So what is the definition of Co-Active? Over the years, we have resisted the many requests to create a definition of Co-Active because we didn’t want to create something dogmatic. Now, however, I feel we have arrived at a definition that is simple and yet broad enough to represent Co-Active appropriately. We are always in this balance and often we are far out of balance. In some cases, we are far over on the “Co” side. This is a place where we are not able to fully bring our ideas into reality and where we can’t quite find clear boundaries. Sometimes we are backing away from our purpose and from the courage that it takes to act. Other times we are being “co” dependent – so focused on relationship and what others think that we lose our sense of self and right action. Other times we swing far over onto the “Active” side, running like hamsters on a wheel, frantically dominated by our “to do” list and yet disconnected from any sense of meaning or relationship. This is often a hallmark of large organizations, where focus can be on results at all costs and our interconnectedness is sometimes pushed aside for profit. 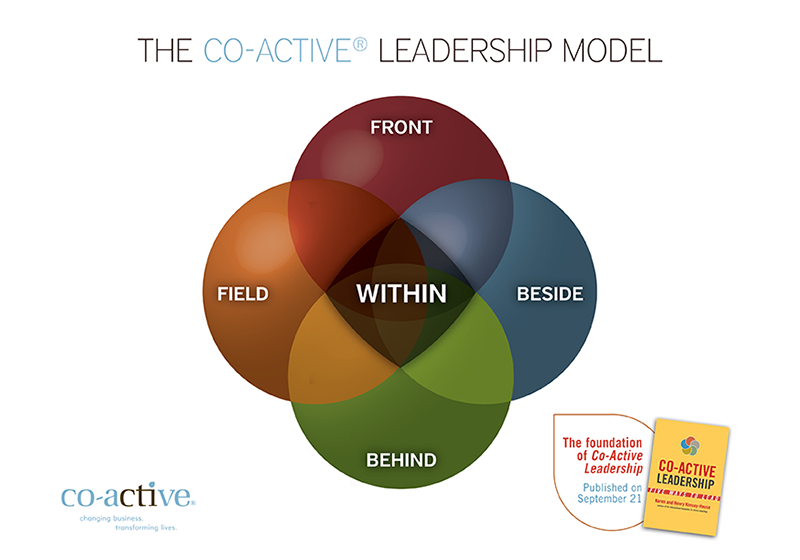 The part of Co-Active that makes it so dynamic and alive is not the “Co” or the “Active”. It’s the hyphen in the middle. The paradox. The “both and” rather than the “either/or”. We human beings are not very good at paradox…we so want to know, to succeed and have it all figured out. Yet, it is the embracing of this paradoxical dance between doing and being that is the key to mastery. It is only when we can embrace paradox that we are truly open to the Mystery and the larger creativity and expansion that is a hallmark of mastery. So how do we “get” Co-Active? 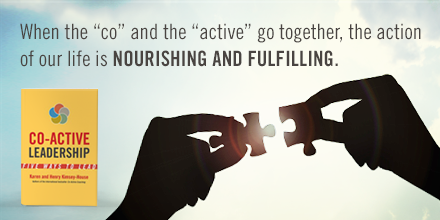 How do we grow and develop our own ability to be Co-Active in our lives? 1. Develop a relationship with your life purpose, understanding that you are here for a reason provides a foundation for action from meaning, from deep inside oneself. 2. Learn to live in the question. Practice wondering rather than knowing. 3. Grow your ability to act with certainty and clarity without attachment. In the beginning, it’s kind of like patting your head and rubbing your belly… and your facility will grow over time. 4. Understand that every single person in your life is there to teach you something. Stay wildly curious about what that might be. Practice gratitude and appreciation of that teaching, even when and especially when you don’t like what that person is doing. 5. Open to your emotions. They are the gas in our engine. They connect us to ourselves and each other and provide the fire to move forward in expansive ways. 6. Becoming comfortable with the dramatic tension between choice and knowing that there are infinite possibilities. 7. Learn to listen to the wisdom of your heart and follow its whisperings. 8. Practice being fascinated by people and by life. 9. Connect with nature. Everything we need to know about Co-Active already exists in the natural world. Spend time being in nature and notice what is unfolding all around you. Top down, one-dimensional leadership models are hopelessly outdated in today’s rapidly-changing world. They waste leadership ability that is present throughout an organization, not just at the top. In this visionary book, Karen and Henry Kimsey-House provide a model that harnesses the possibility of many, rather than relying on the power of one. Download a sample chapter or order yours now on Amazon.